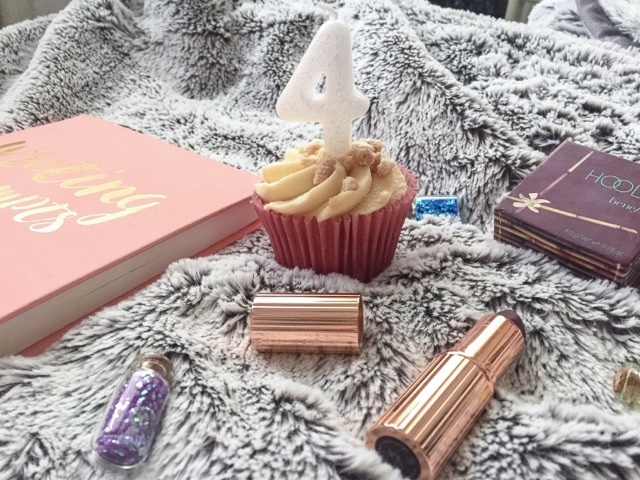 4th Blog birthday and Urban Decay lipstick giveaway! If someone told my shy 16 year old self that in 4 years time, she'd have stuck to this blog and become the person she has today I wouldn't have believed you. What started out as a fun idea has turned into my favourite hobby. Writing my blog brings me an endless amount of happiness and I'm incredibly thankful I began it 4 years ago today. I love the process of coming up with creative ideas, sharing my thoughts online and then interacting with readers of mine to hear their views. It's become my online happy space and now, I wouldn't know what I'd do without it. I feel blessed to have an established platform where I can share my voice. Over the course of 4 years, my blog has grown with me. I've used it as an online diary for my adventures, to share special moments and whichever thought comes to mind. Its changed with me, through my tone of voice and in confidence. I'm now nearly 21 years old, a confident young woman who has come to terms with who she is and learnt to love all her flaws. A girl whose suffered badly with anxiety, can now conquer all she puts her mind to. The growth in my blog is a reflection on who I am. I'm extremely proud of my little space on the internet, for keeping at it, writing about what I love and sharing that with others. I'd like to say a massive thank you! Whether you began following my blog all those years back or have just stumbled across it, thank you for taking the time to read my words and sending every piece of lovely feedback. The beauty blogging community as a whole is so encouraging and I'm thankful to be apart of it. Whenever I speak to other bloggers on social media, they're always so kind and supportive of everything I do. I have a lovely bunch of girls on Instagram and Twitter groups which I'm really grateful for who everyday, offer their support in every way. To commemorate this exciting occasion, I wanted to do a giveaway. Instead of putting a bundle of prizes together, I've decided to let my readers choose one of their favourite Urban Decay lipsticks to win. Lipsticks are my favourite makeup products and I have quite the collection so thought I'd offer one to my readers. Would you like to win a Urban Decay lipstick of your choice? Enter below! Open to UK entrants only. I hope you enjoyed this reflective post. I'm intrigued to know, how long have you been reading my blog? At the moment, I'm loving Charlotte Tilbury's Pillowtalk lipstick - it's beautiful! Perfect every day shade and I'll be wearing it a lot this summer. I switch through different shades throughout the summer so it all depends on my mood! Massive massive congrats on four years of blogging, that's an incredible milestone! I'm not surprised that you feel so proud of your blogging career thus far, you've done a fab job! This was so lovely! Happy 4th birthday, I've only been blogging for 4 months and I can already feel how much it's changed me, so I can't imagine how much 4 years has helped you! Congrats! happy 4th blog birthday! that is amazing! I love NYX soft spoken liquid suede. I love Illamasqua's Over lipstick - its the perfect bright coral/orange!